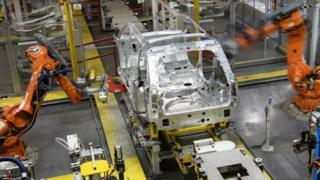 Jaguar Land Rover (JLR) will today announce it is cutting up to 5,000 jobs from its 40,000 strong UK workforce. Management, marketing and administrative roles are expected to be hardest hit, but some production staff may also be affected. The layoffs are part of a £2.5bn cost-cutting plan amid what industry insiders have called a "perfect storm". They mean a downturn in Chinese sales, a slump in diesel sales and concerns about UK competitiveness post-Brexit. JLR is particularly exposed to the first two of these factors. JLR has seen its employee numbers soar as its revenues have expanded. China is the company's biggest and hitherto most profitable market. But sales in China have fallen nearly 50% in recent months as cautious Chinese consumers have been holding back on big ticket purchases amid global trade tensions. The relationship between JLR and its Chinese sales network have also been strained as dealers demand better terms and promotional incentives. What's gone wrong at Jaguar Land Rover? The issues at JLR have arisen as Ford is also looking to cut back on its workforce numbers in Europe. Are you a Jaguar Land Rover employee? Will you be affected by the job cuts? Email haveyoursay@bbc.co.uk. JLR is also one of the most heavily-exposed car makers to ongoing consumer confusion about the wisdom of buying a diesel car in the aftermath of the VW emissions scandal. Ninety per cent of its vehicles are diesel-powered, although it has been investing in new electric and hybrid vehicles. Today's job losses come on top of cuts made last year. In Solihull, 1,000 agency workers were laid off in 2017. At Halewood in Merseyside, 180 agency staff were cut. In Castle Bromwich, 1,000 employees were put on a three day week for the last three months of 2018. Meanwhile, Jaguar has been increasing headcount elsewhere in the world. In China it has hired 4,000 workers since 2014. Most recently it announced it would move all production of the Land Rover Discovery to a new plant in Slovakia with plans to hire up to 3,000 workers. Unions are keen to examine whether JLR's international plants will continue to see additional investment at the expense of the UK. They are also concerned that the company is not permanently reducing its UK production capacity in the face of what could prove to be short-term headwinds. The company has sounded some of the most urgent warnings among UK manufacturers about the damage that Brexit uncertainty was doing to investment in the UK. In July last year, the company said it needed more certainty around Brexit in order to continue investing in its UK operations and warned that a "no-deal" Brexit would cost the company more than £1.2bn in profit each year. Most commentators have concluded that the chance of a no-deal Brexit have increased with the governor of the Bank of England recently describing the probability as "uncomfortably high". Of all JLR's problems, the biggest flashing red light is a collapse in sales in its biggest market - China. But the company has been saying for more than a year that Brexit uncertainty would eventually take its toll on the perception of the UK as a stable and competitive base for global manufacturing. If, as expected, the UK bears the brunt, or the entirety, of JLR's global cost-cutting, JLR may well say it tried to warn us.